Something that RPG players have always known is that while playing one adventure is fun, playing a series of adventures with the same character is better. New players become better players, and characters evolve and level up as the challenges increase with them. In the olden days, Game Masters would either write their own adventures (and they still do), or they would collect individual, unrelated, adventure modules as their players leveled up. Then Pathfinder happened and soon after the advent of the published Adventure Path. Multi-part adventures written with a continuing story that gets bigger and harder as players progress. After years of successful Pathfinder Adventure Paths, it was a no-brainer that Starfinder would do it also. Sure enough August brought fans a slew of Starfinder goodness, including the first of six parts in the bimonthly Adventure Path, Dead Suns. Each volume of Dead Suns (and future APs) includes more than just another chapter in the campaign. There is information for both GMs and players alike. There’s a gazetteer full of details about Absalom Station and a chapter of ancient Golarion relics that can be used in home-written games. The Alien Archive chapter presents seven new creatures (some from this adventure, some not), and is laid out to integrate with the full Alien Archive resource book. There is also a Codex of Worlds entry for Heicoron IV, expanding Starfinder into the Near Space beyond the Pact World system. Lastly, we get the finished stats and deck plans for a new prebuilt starship. This content design is brilliant. Not only does it include everything you need to run that specific adventure, but lets Paizo put out a steady stream of new worldbuilding content to people without them having to wait for a full-sized hardcover resource book. That’s not to say that the full-sized books aren’t also coming. Alien Archive is out now, the Pact Worlds supplement is expected in March, with an Armory book following in July just in time for the second Adventure Path to start in August. So far, the one thing I’ve only just touched on is the actual adventure component of the Adventure Path. If you are a player who may want play this adventure, you’ll obviously want to skip this part of the book, but I won’t be giving away any spoilers here. 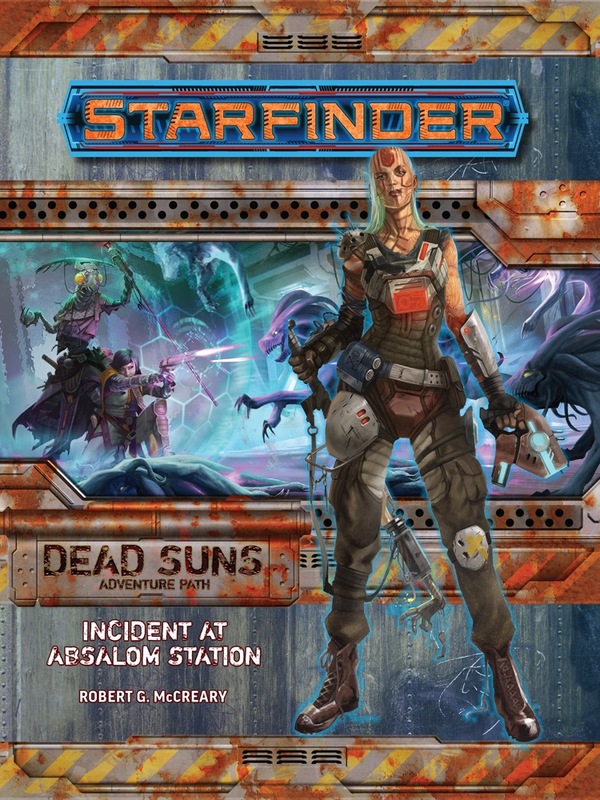 Dead Suns launches with Incident at Absalom Station, for characters who are starting at level 1, with the overall content following the same formula as the Pathfinder APs. The adventure is split into three parts, each long enough to play as it’s own short session or combined into one big session, depending on the stamina of your gaming group. All the information, maps, and stats, that are needed to run the adventure is included, with references pointing to additional resources given when applicable. This isn’t a completely self-contained game, of course. There are few points when sections of the Core Rulebook are specifically referenced, rather than copy them into the book, so you’ll need access to that to properly run this. The official summary of the plot is given below. There’s nothing particularly “groundbreaking” in Incident at Absalom Station, nor do I really expect there to be for the remainder of the Dead Suns AP. But there doesn’t need to be anything groundbreaking since there isn’t a lot of ground in space. Snarky comments aside, many of the criticisms I’ve seen surrounding this are from players who have been playing Pathfinder for some time and discount the fact that this isn’t actually Pathfinder. Starfinder is it’s own game and will attract its own players who may not have, nor necessarily want, the context of Pathfinder’s 20-year history. Dead Suns is going to be most of those players first experience with playing Starfinder, and possibly even their first RPG experience, and it does a great job balancing new and old players experience. One of the really neat things that Paizo offers is the ability to subscribe to their product lines. So if you don’t have a Friendly Local Game Store nearby, you can order a single book, or have them send you all the copies as they come out (with a free PDF version as well). They have several different subscription package options, so it’s worth a look.